Employees at Cypress Bayou Casino Hotel presented a large donation to the Emergency Aid Center, for United Way of South Louisiana. Patti Ibert poses with a recent donation made by the employees of Cypress Bayou Casino Hotel. Employees at Cypress Bayou Casino Hotel presented a large donation to the Emergency Aid Center, for United Way of South Louisiana. The center is always in need, however, with the holidays around the corner, families in West St. Mary Parish will experience greater need when the children are out of school. Employees came together to donate non-perishable items to help relieve the strain on the EAC’s resources. The mission of the EAC is to provide assistance to families in West St. Mary experiencing harsh circumstances such as unemployment, loss of hours, illness, death of the primary wage earner, fire, flood, and other natural disasters. “With the children out of school, the current economy, and various other circumstances we see an increase in need for local families,” said Director Patti Ibert at Emergency Aid Center. “We are lucky to have such a passionate community to help those in need,” Ibert continued. 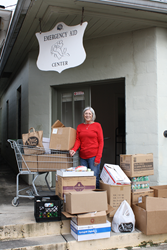 The center is the only food bank in West St. Mary Parish. “Our employees come together a few times a year to make a donation to the Emergency Aid Center,” Linda Nezey, Manager of Human Resources at Cypress Bayou Casino Hotel. “Contributions to the EAC has become somewhat of a tradition at Cypress Bayou Casino Hotel and we could not be more proud of our employees for their commitment to help those in need,” continued Nezey. Though local organizations, businesses, and private citizens are still donating, there is always a need for more. The Emergency Aid Center is located at 106 Commercial Street, Franklin and accepts donations most days of the week, however, as Ibert stated, “We also accept personal hygiene items, diapers, and cleaning supplies.” For more information on the Emergency Aid Center, call (337) 828-0921. Cypress Bayou Casino Hotel, Chitimacha Tribe of Louisiana, and their employees are proud contributors to several local charities and non-profits for the greater common good of the people of Acadiana.